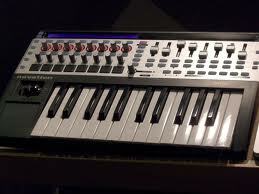 This is a wonderful Midi controller and a DAW controller as well. You can control instruments, mixing, plug-ins and more. It has 8 faders and 16 knobs. The keys are semi-weighted and it has a bright LCD screen so you can see what is assigned to what. It is easy to map all the controls to adapt to your DAW. It even has auto-map software. It can be powered through USB or a 9 V DC power supply which is an optional add on. It is small in size but very powerful. It also has drum pads. It sells for around $400 at Guitar Center. Click the link below for exclusive deals. Dedicated, yet fully-assignable transport buttons. Do not forget to submit your music to these two radio networks. Both have worldwide listener bases and you can submit your music on the site by clicking the submit music link.